Action Performance Companies Inc., the leader in the design, promotion, marketing and distribution of licensed motorsports merchandise, today announced the release of two limited edition National Hot Rod Association funny car die-cast replicas featuring Tony and Cruz Pedregon of Pedregon Racing and Grammy�-winning recording artist Carlos Santana. The Pedregons unveiled the Quaker State/Santana and Advanced Auto Parts/Santana Chevrolet Monte Carlo funny cars as part of a press event on Friday, September 24 at the Texas Motorplex in Dallas. The announcement also confirmed that, in addition to showcasing Santana aboard the Pedregon Racing funny cars during the Las Vegas NHRA Nationals on Oct. 28-31, 2004, the Latin guitar virtuoso himself will make an appearance at The Strip at Las Vegas Motor Speedway for the penultimate race of the 2004 NHRA season. 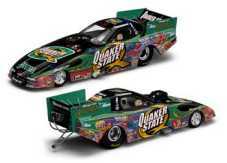 Tony Pedregon, who claimed his first NHRA funny car championship with John Force Racing in 2003, will drive the Quaker State/Santana Chevrolet Monte Carlo funny car, while his brother Cruz, the 1992 NHRA funny car champion, will roll out the Advance Auto Parts/Santana Chevrolet Monte Carlo. The cars incorporate imagery taken from the multi-platinum albums Shaman and Supernatural. Both drag machines also include the Milagro Foundation "angel" logo as part of their paint schemes. Santana and his wife Deborah established the Milagro Foundation in order to provide support for a multitude of charitable causes. 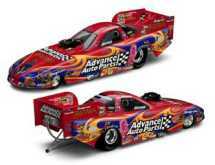 Action Performance will produce replica versions of the both the Advance Auto Parts/Santana and Quaker State/Santana Chevrolet Monte Carlo funny cars. The cars can be ordered via Action�s standard distribution channels, including the 16-member Action Racing Collectables distributor network and Racing Collectables Club of America. A portion of the proceeds from sales of these Santana-themed die-cast collectibles will go to the Milagro Foundation. To locate an ARC distributor, please call 1-800-411-8404. To join RCCA, call 1-800-952-0708 or visit www.goracing.com. "Carlos Santana has become an icon in Latin and World music by sharing both his tremendous talent and his dedication to giving back to those who need help," said Fred W. Wagenhals, Action Performance�s chairman, president and CEO. "Santana is a pioneer, so it is fitting that he is teaming up with the Pedregon family, who also are trailblazers in their own right. Action Performance is proud to be participating in this unique drag racing program." Milagro Foundation is the charitable public foundation established in 1998 by Deborah and Carlos Santana. Milagro makes grants to community-based organizations that work with children around the world in the areas of the arts, education and health. We believe that life is a miracle (milagro) and that children everywhere deserve the opportunity to lead educated, safe, healthy and creative lives. www.milagrofoundation.org.